It’s a sign of how official politics has moved to the right that some people get sentimental about long-retired reactionary leaders. Compared to John Howard and Tony Abbott, Malcolm Fraser was held up by many as a moderate. Yet at the time he was elected, he was known as an anti-worker, ruling-class warrior. Compared to Donald Trump, George Bush Senior was increasingly regarded as a kindly old man who stood for decency in public service—especially after calling Trump a “blowhard” and voting for Hillary Clinton in 2016. The Guardian, writing of his death on 30 November, praised him for shepherding, “the US through a turbulent period in global relations that included the breakup of the Soviet Union and the Iraqi invasion of Kuwait”. None of this could be further from the truth. 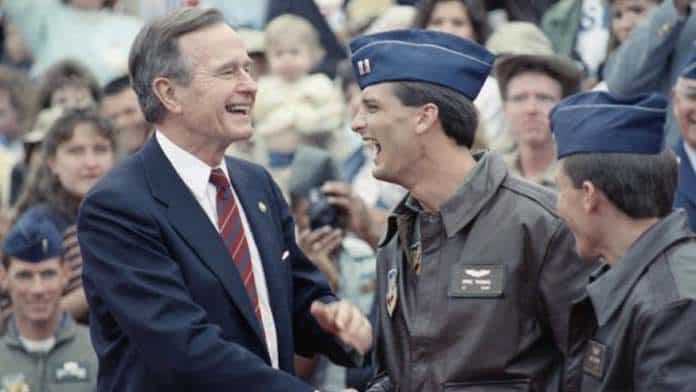 George HW Bush was a brutal conservative whose invasion of Iraq in 1991 laid the basis for the further horrors visited on that country, and Afghanistan, by Presidents to come, including his son, George W.
Bush became an oil millionaire in 1964 and remained a faithful servant of big business throughout his life. His career included a stint as Chairman of the Republican National Committee and Director of the CIA. He later became a life member of the National Rifle Association. His time in office coincided with the collapse of the Soviet Union. Bush saw this as an opportunity to reshape global politics under unquestioned US hegemony—a project he later called the New World Order. His first act of imperialist aggression came in December 1989, when he ordered 24,000 troops into Panama to remove President Noriega from power. It was the first US military operation in more than 40 years that was not related to the Cold War. This was just a prelude to his assault in Iraq. Until 1990, the US had backed Iraq under Saddam Hussein, especially in its bloody war with Iran. But in August, Hussein invaded Kuwait, thinking the US had greenlighted the operation. Bush saw this as an act of insubordination and a potential threat to Saudi Arabia. 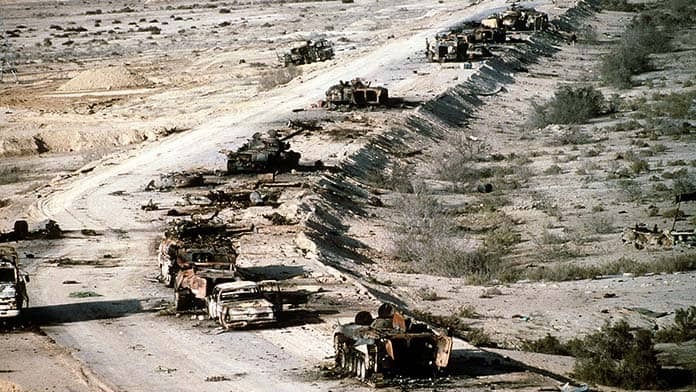 In January 1991, the US launched an attack on Iraq—Operation Desert Shield—which included more than 4000 bombing runs by aircraft operated by the Coalition of the Willing, which included Australia under Labor Prime Minister Bob Hawke. In February, a ground invasion took place that drove back the Iraqi army. Coalition aircraft bombed retreating columns of Iraqi soldiers in what was called a turkey shoot. British journalist Robert Fisk said he, “lost count of the Iraqi corpses crammed into the smouldering wreckage or slumped face down in the sand”, and saw hundreds of corpses strewn up the road all the way to the Iraqi border. Bush ordered the invasion to halt, but only because conquering the country meant, “we would have been forced to occupy Baghdad and, in effect, rule Iraq”. What the father declined to accomplish was completed in 2003 by his son. Millions died in Iraq and Afghanistan from military action, hunger and preventable disease. Bush was a warmonger who sired another. We shed no tears for him, but for his many victims.